My name is Ben Ramsfield and I was born and raised here is Shelton. Although I moved to the Olympia area for a short time, I returned here because Mason County is home. I have a one year old daughter and a son who is due in July. My passion is the outdoors and when I have time I am out riding my quad. I may be the newest agent with the Richard Beckman Realty Group, but my background in real estate and real estate related services is quite extensive. I have worked in Mason County Community Development assisting with building, environmental health and planning permit processing as well as working in the Mason County Assessor´s office as a clerk and certified real property appraiser. My background and passion for real estate coupled with my knowledge of technology make me the ideal person to help you either find and buy properties or sell your properties. 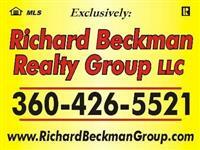 Ben Ramsfield recently joined the Richard Beckman Realty Group, LLC. Ben is a Shelton Realtor. As a Mason County real estate agent he can assist in all your real estate needs.